Are Spa Treatments For Babies Worth the Bucks? A day at the spa can act as a stress reducer and melt away the tension of the week for many of us, including babies. That’s right, babies now have the option of receiving infant spa treatments in one Houston establishment called Float Baby. Today reports about the baby spa that offers hydrotherapy as well as mini full body massages for babies as young as just a few weeks old. 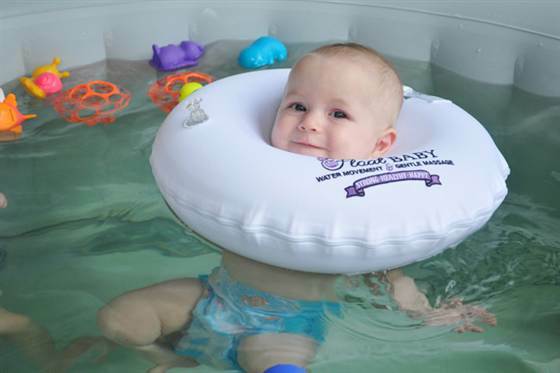 Owner of the spa, Kristi Ison, explains how her hydrotherapy sessions, which consist of babies floating in warm water with the aid of a specially sized flotation ring to support their heads and necks, can be beneficial for little ones. Babies ages 2 weeks to 6 months are placed in a small pool with their flotation devices fitting snuggly under their chins and outfitted in a swim diaper. The water is purified and cleaned out daily with temperatures kept at a comfortable 95 – 98 degrees. Ison explains that younger babies usually are more relaxed in the pool, probably because the memories of the womb are still fresh in their minds. The spa also offers baby massages given by the parents with instruction by Ison. A baby’s visit to this spa will run you $65 which may be worth it to some parents for the photo ops alone. But others choose to replicate the experience for free at home with a nice warm bath and a snuggle. What do you think of the baby spa that offers infant massage and hydrotherapy? Would you consider taking your little one to a spa like this? No. Sounds like something safer to do at home w/ instructions from pediatrician or at a certified baby swimming lesson course. Save the money. Great bonding time though for baby and parent(s).